A pair of three metre sofas upholstered in a soft grey velvet with a pleated velvet back on Nickel feet. 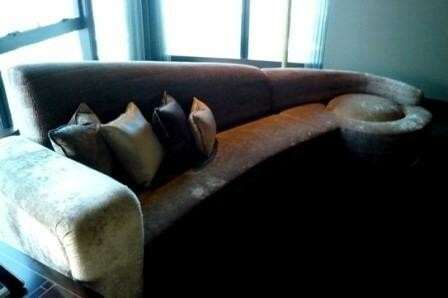 Opposite Sofas have made a complete semi-circle, set up with an art deco bronze inlay coffee table separating the two. The ultimate in comfort, while create an intimate look in a luxurious home theatre.